The suction valves described in this page have been designed for a quick vacuum connection on press bags for composite fibre products. These valves are composed of a steel distributor, to be inserted inside the bag, equipped with a cam housing suitable for the quick coupler for the vacuum connection. The latter is made with reeded and anodised aluminium and is easily coupled with the distributor by simply rotating it on its axis by 90°, once it’s been inserted. A silicon seal to be placed between the two elements and the press bag, guarantees a perfect vacuum seal. 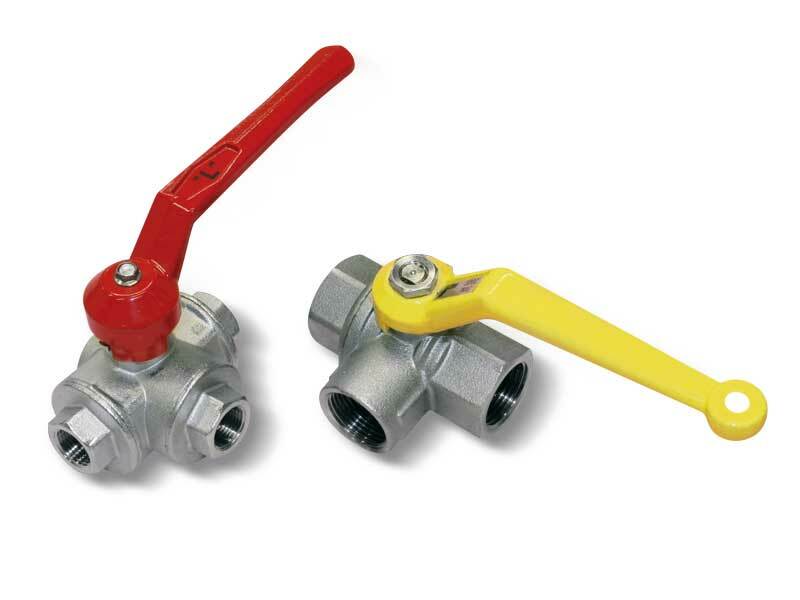 Manual 2-way valves, quick couplers or simply flexible pipe fittings can be assembled onto these valves. They are currently available in the two versions indicated in the table, but can be provided in different sizes and shapes upon request for a minimum amount. 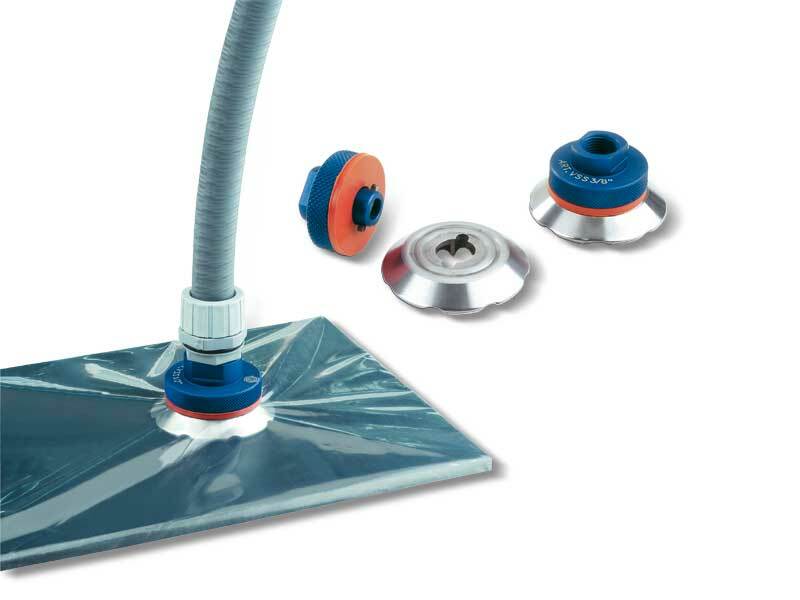 These suction valves, once laid on the resin infusion mould connections, allow a quick vacuum connection and guarantee a perfect seal. They are made with silicon rubber, while their support is made with anodised aluminium. They are available in the two versions shown below, but can be supplied in different sizes and shapes upon request. Plunger valves are composed of a cylindrical brass body, a steel plunger with a conical valve and a thrust spring. Connected to vacuum, they are normally closed. They activate suction, thus creating vacuum, only when the plunger is in contact with the gripping surface. They are available in various versions, all suitable for our vacuum cups. These valves are composed of an anodised aluminium body, a steel pin solidly connected to a conical shutter and of a thrust spring. They activate suction, thus creating vacuum, only when the pin is activated by the cams or any other mechanical device. They can be used as an alternative to plunger valves when these cannot be assembled onto the vacuum cups. Valves with ball shutters activate suction, creating vacuum in the cups on which they are applied, only when the load to be held activates the sealing shutter. They are made of an anodised aluminium body, a nylon ball shutter, a calibrated thrust spring and a threaded brass closing plug. When properly calibrated, they guarantee a perfect vacuum seal. They are recommended for making vacuum operated clamping surfaces. They can be supplied in different sizes and shapes upon request and for a minimum quantity to be defined in the order. 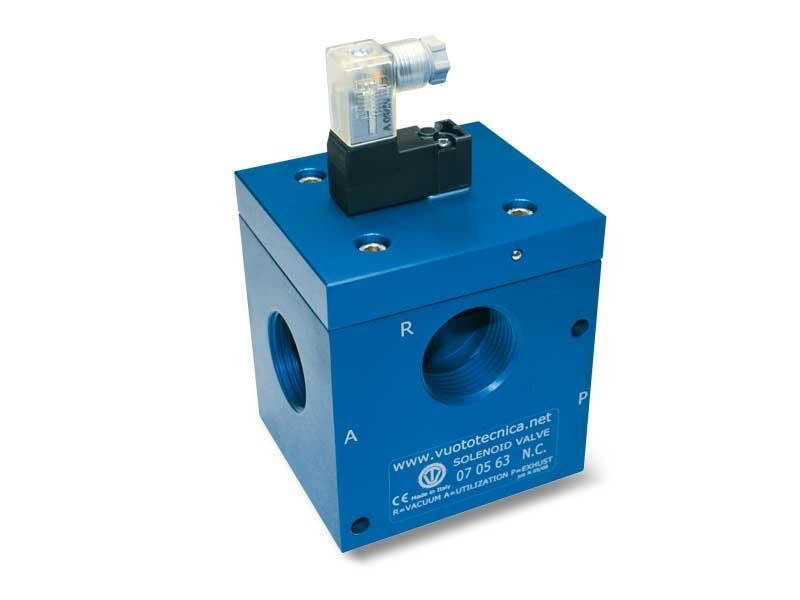 They are special unidirectional valves that, when properly calibrated, allow a certain quantity of fluid to go through, afterwards, if the fluid continues to go through, they automatically close. These shut-off valves have been specially designed to be applied on the cups and, in case of lack of objects to be gripped, of defective grips or leaks, they automatically deactivate suction, thus preventing any reduction of the vacuum level on the other gripping cups. They are provided calibrated and commissioned, ready to be installed. They are made with anodised aluminium and can be supplied in different shapes and sizes upon request and for a minimum quantity to be defined in the order. 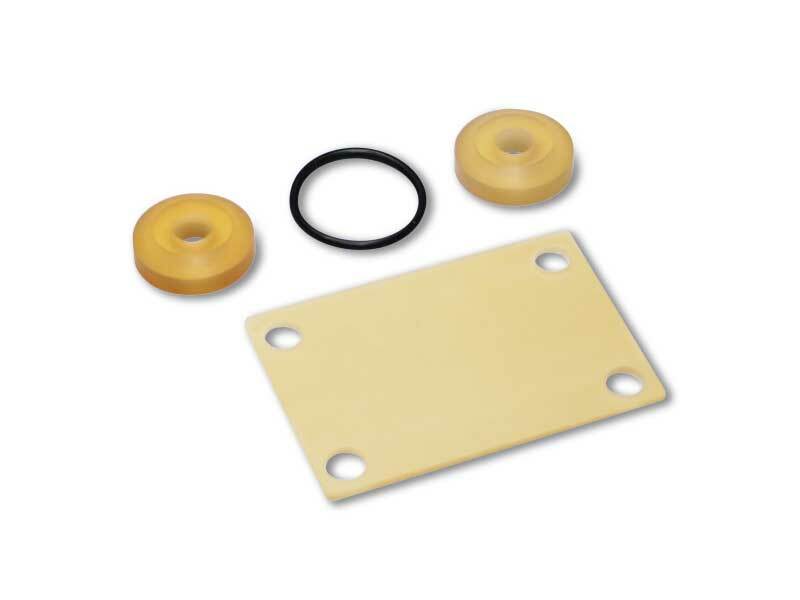 These unidirectional valves are made with bronze and brass with a seal in NBR nitrile rubber or, upon request, in Viton®. To ensure a practical assembly they are available in two versions: horizontal and vertical. Fitted on the vacuum pump suction inlet, as soon as the latter stop, these valves prevent the air from returning in the plant (piping, tanks, autoclaves, vacuum gripping systems, vacuum cups, etc. ), guaranteeing a perfect seal and preventing the oil from returning into the pump stator, which would cause considerable damages. Therefore, check valves are mandatory on all vacuum pumps with lubrication that do not have them built-in. These valves have the same features of the other check valves, but they are made with anodised aluminium, which makes them particularly light. The seal is guaranteed by an EPDM membrane instead of the metal shutter with NBR seal. For these features and for their modern design, they are recommended for pneumatic vacuum generators and, of course, on vacuum pumps. 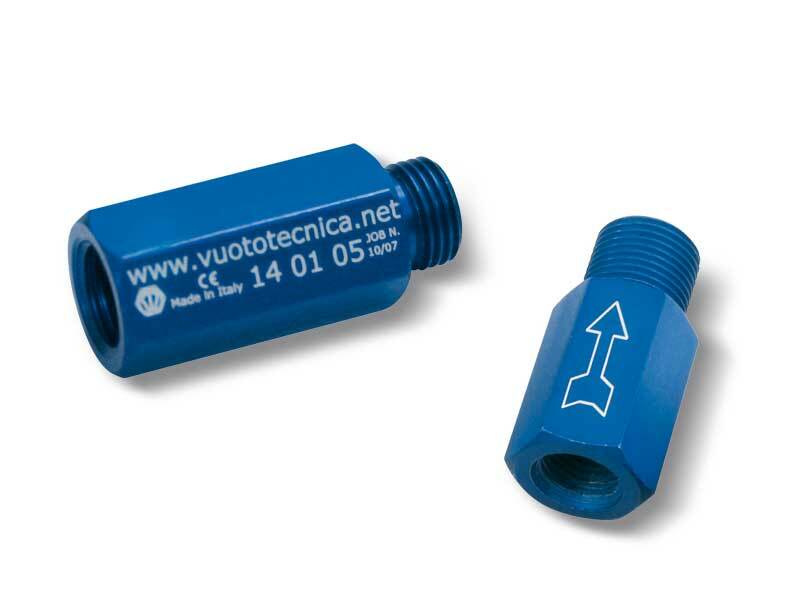 These small manual valves are suited for intercepting vacuum on vacuum cup holders and any small utility in which solenoid valves cannot be installed. They feature a hexagonal nickel-plated brass body, a chromed brass ball shutter and a seal in plastic material to guarantee a perfect seal. A lever on the ball shutter, rotated by 90°, allows opening or closing the valve with no effort. These manual valves are used for intercepting vacuum in all those plants where solenoid valves cannot be installed. They feature a die-cast nickel-plated brass body, a chromed brass ball shutter and teflon seals to guarantee perfect seal even at high temperatures. These 2-position, 3-way valves feature pneumatically activated conical shutters. They can be normally used either open or closed. They are recommended in all the cases that require a quick exchange between the vacuum pump suction and the air inlet into the circuit for a quick restoration of the atmospheric pressure. They are composed of an anodised aluminium body, two vulkollan® shutters assembled onto a stainless steel stem, a membrane for servo-control made with special compounds and a thrust spring for the shutter return. 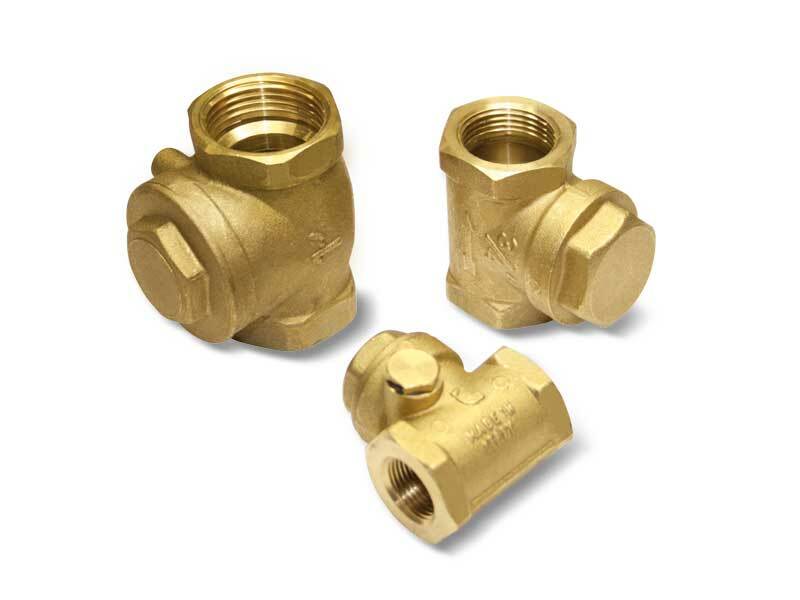 These valves allow reducing frictions and internal dynamic stresses to the minimum. The result being a high response speed and a guarantee of long lasting duration. 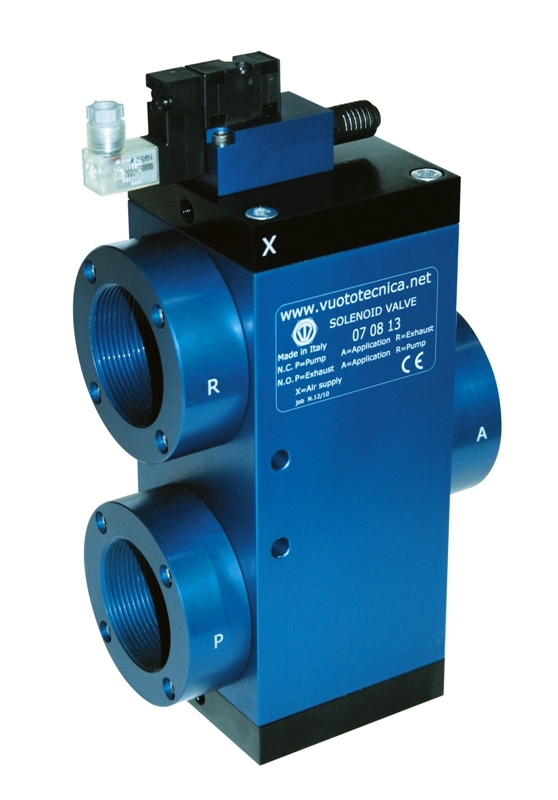 These direct-drive valves have been specially designed for vacuum and are normally closed. They are composed of an anodised aluminium body, where the connections and the passage orifices are located, and of an actuator which is activated by an electric coil. 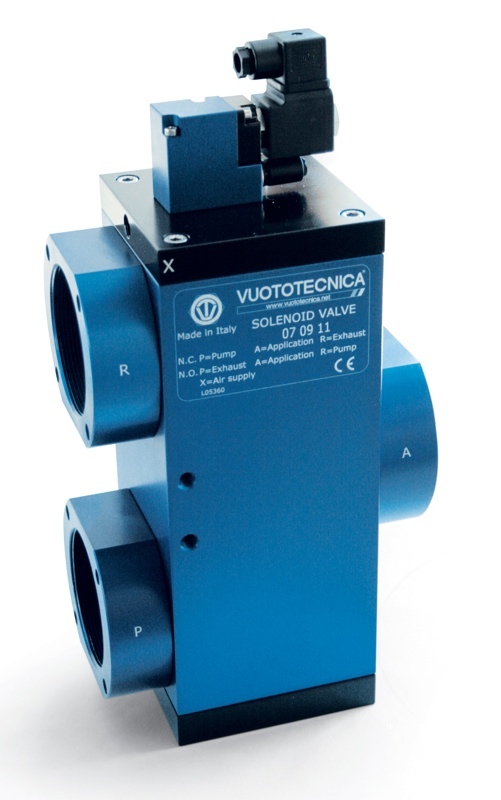 The solenoid pilot valve shutter in NBR nitrile rubber or Vulkollan®, is an integral part of the actuator mobile core. 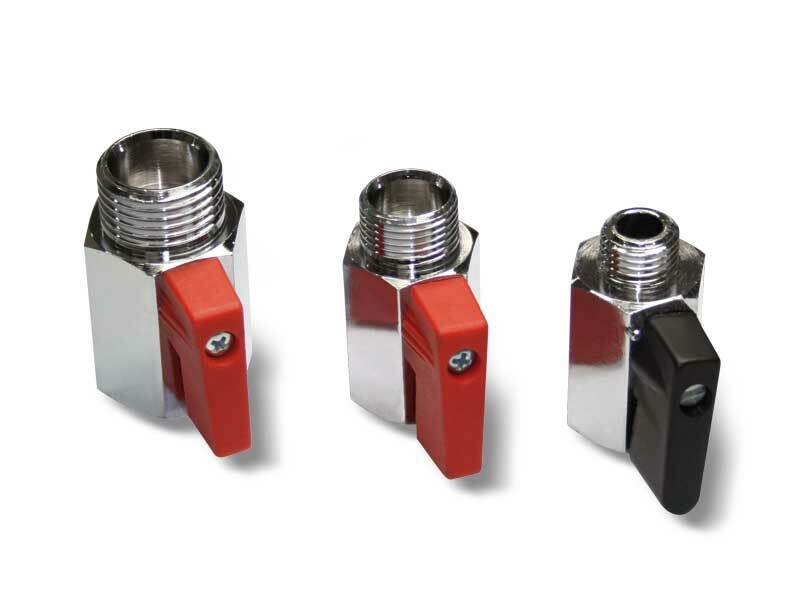 Both the orifices of the 2-way solenoid pilot valves have the same size, while those of the 3-way ones have a 3mm outlet diameter, obtained through the tube. The very low reaction time allows carrying out a very high number of cycles per minute. The standard electric coil is fully plasticised with synthetic resin, tight execution, insulation class F (up to 155 °C) compliant with VDE standards, with 6.3 mm 3-terminal electrical connections in compliance with EN 175301-803 (ex DIN 43650). Protection degree IP 54; IP 65 for inserted connector. Allowed tolerance on the voltage nominal value: ±10%. Max. absorption: 16.5 V.A. with AC and 16 W with DC. The electric coil can be rotated by 360°. The connector can be rotated by 180° on the coil and can be supplied, upon request, with Led lights, anti-interference circuit and/or with protection devices against overvoltage and polarity reversal. Working pressure: from 1 to 1500 mbar abs. 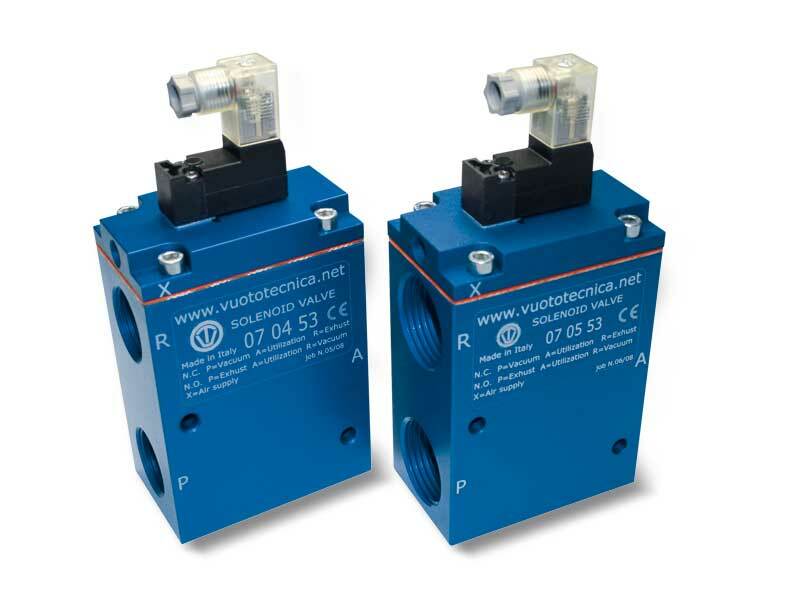 These state of the art solenoid valves feature minimal overall dimensions and high volumetric efficiency and high response speed at any vacuum level. They are the result of an attentive choice of materials, state of the art constructive techniques and of the in-depth knowledge of our technicians. This series of solenoid valves is patented. The DDN solenoid valves are direct drive, 2-way, 2-position valves with direct drive, double shutter and they are normally closed. They are composed of hot pressed brass body where the connections are located, an internal mechanism with double shutter and of an actuator activated by an electric coil. The standard electric coil is fully plasticised with synthetic resin, tight execution, insulation class F (up to 155 °C) compliant with VDE standards, with 6.3 mm 3-terminal electrical connections in compliance with EN 175301-803 (ex DIN 43650). Protection degree IP 54; IP 65 with inserted connector. Max. absorption: 16.5 V.A. with AC and 16 W with DC (except for DDN 25 which cannot be activated with DC). The electric coil can be rotated by 360°. The connector can be rotated by 180° on the coil and can be supplied, upon request, with Led lights, anti-interference circuit and/or with protection devices against overvoltage and polarity reversal. For a correct operation, we recommend installing the solenoid valve upside-down. DDN solenoid valves are particularly indicated for degassers, autoclaves, vacuum thermo-welders and in all applications where suction has to be controlled separately from the air inlet into circuit. Working pressure: from 0.5 to 1500 mbar abs. The 3-way vacuum solenoid valves in this series are 2-position valves with pneumatically servo-controlled conical shutters. They can normally be used either open or closed. They are composed of an anodised aluminium body, two Vulkollan® shutters assembled onto a stainless steel stem, a membrane for servo-control made with special compounds and a thrust spring for the shutter return; an actuator activated by an electric coil managed the compressed air supply. 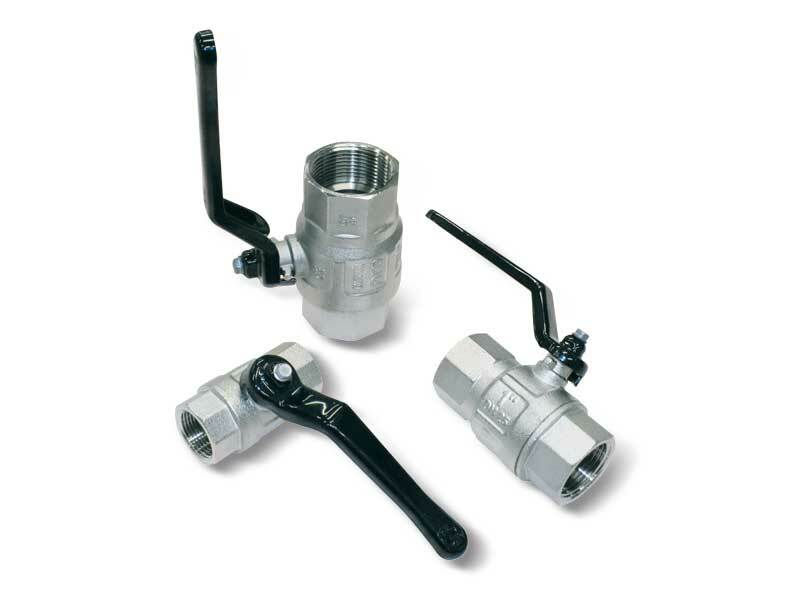 These valves allow reducing frictions and internal dynamic stresses to the minimum. The result being a high response speed and a guarantee of long lasting duration. The standard electric coil is fully plasticised with synthetic resin, tight execution, insulation class F (up to 155 °C) compliant with VDE standards, with 6.3 mm 3-terminal electrical connections in compliance with EN 175301-803 (ex DIN 43650). Max. absorption: 16.5 V.A. in c.a. e 16 W in c.c. The connector can be rotated by 180° on the coil and can be supplied, upon request, with Led lights, anti-interference circuit and/or with protection devices against overvoltage and polarity reversal. 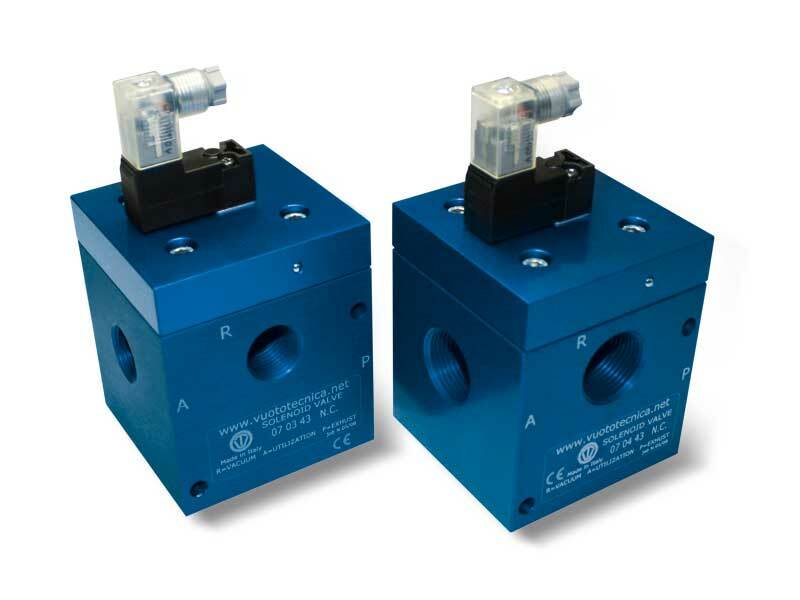 3-way vacuum solenoid valves are usually used for intercepting vacuum on feeders and cup stackers, robots, sheet feeders, sack openers and in all those cases where a quick response is needed between suction and the air inlet into the circuit, for a quick restoration of the atmospheric pressure. They can be supplied upon request with an SM device for manually opening and closing the solenoid valves already installed. 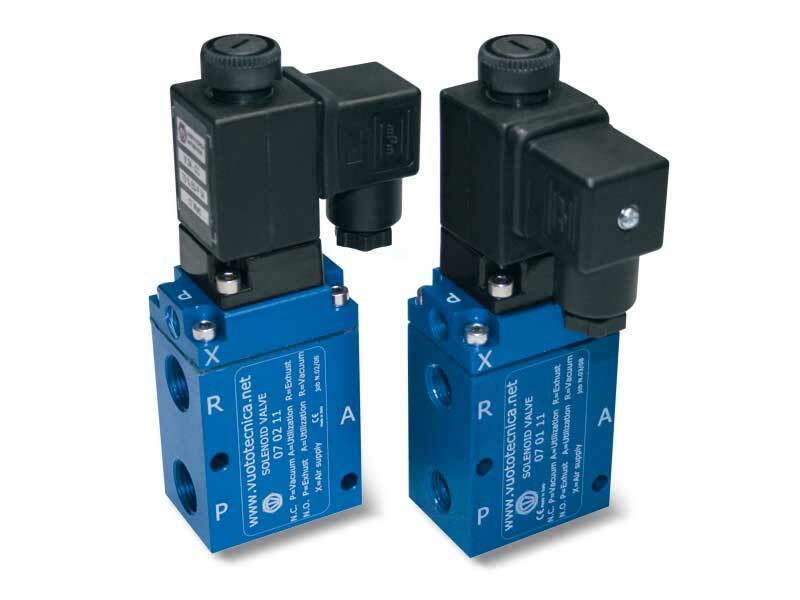 These solenoid valves have the same function and the same structure as the previous ones. Their distinctive features are the two coils that with a simple electric impulse, exchange the shutter positions and keep them in this position till the next impulse even in absence of compressed air at the servo control and of electric current. For this feature, they are especially indicated in all those cases which require a safe connection to the vacuum source, even in absence of electric or pneumatic supply. 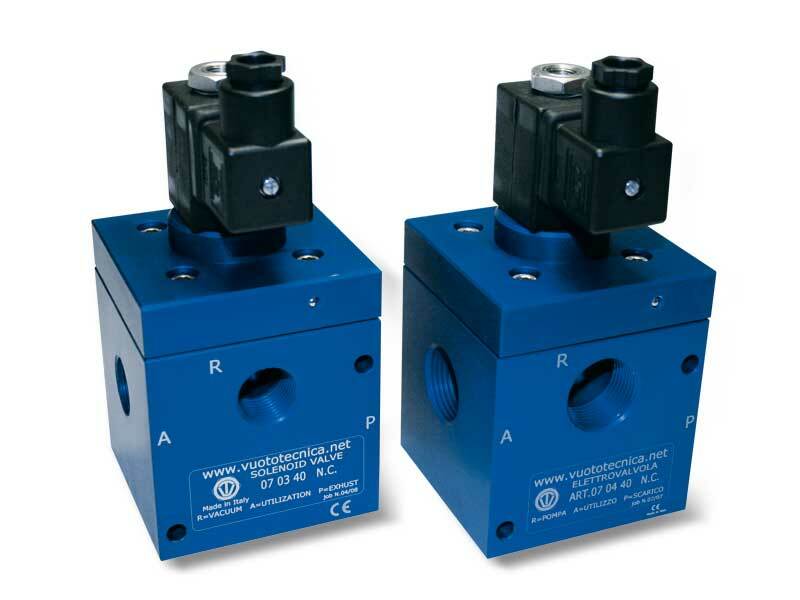 These direct drive 3-way, 2-position vacuum solenoid valves feature conical shutters servo-controlled by the vacuum. As a standard they are normally closed, but they can be supplied normally open upon request. They are composed of an anodised aluminium body where the connections are located, two silicon shutters assembled onto a stainless steel stem and a membrane in special reinforced compound. An actuator activated by an electric coil manages the vacuum at the servo-control. The operating principle of these solenoid valves is based on the pressure differential between the vacuum pump or generator and the pressure of the sucked air. By addressing this “differential pressure” to the servo-control via the actuator, the shutters can be controlled without compressed air or springs. Due to their operating principle, they are not recommended on plants with low vacuum levels (below 850 mbar abs., equal to 15 % of vacuum). The lack of springs, frictions and internal dynamic stresses favours a high response speed and guarantees long lasting operation. The standard electric coil is fully plasticised with synthetic resin, tight execution, insulation class F (up to 155 °C) compliant with VDE standards, with 6.3 mm 3-terminal electrical connections in compliance with EN 175301-803 (ex DIN 43650). The solenoid valves in this series, along with the uses described for the 07 .. 11 series can be used on plants with no compressed air. They can be provided, upon request, with SM device for manually opening or closing the solenoid valve already installed. The solenoid valve must be always chosen according to the capacity and, therefore, to the vacuum pump or generator suction connection. Working pressure: from 0.5 to 850 mbar abs. Electric coils are windings of copper wire on nylon coils fully plasticised in synthetic resin which activate the electromagnetic actuators with which the solenoid valves are provided. Crossed by an electric current, these coils generate a magnetic field which activates the mobile core inside the actuators; the mobile core features a built-in or fixed shutter which cause the valve commutation by opening and closing their orifices. Electric absorption: 8 ÷ 16.5 V.A. with AC and 6.5 ÷ 16 W with DC. Electric coils can be rotated by 360°. 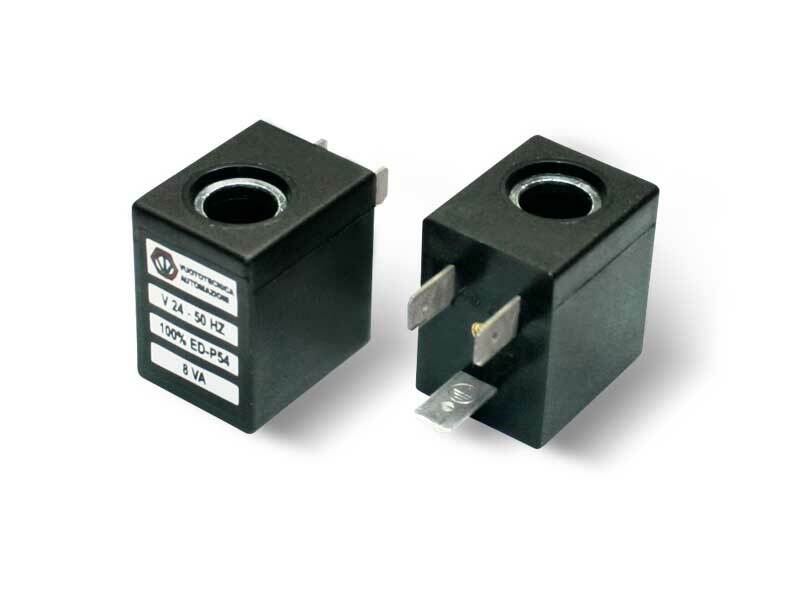 Connectors are fundamental for bringing electric current to the solenoid valve coils. 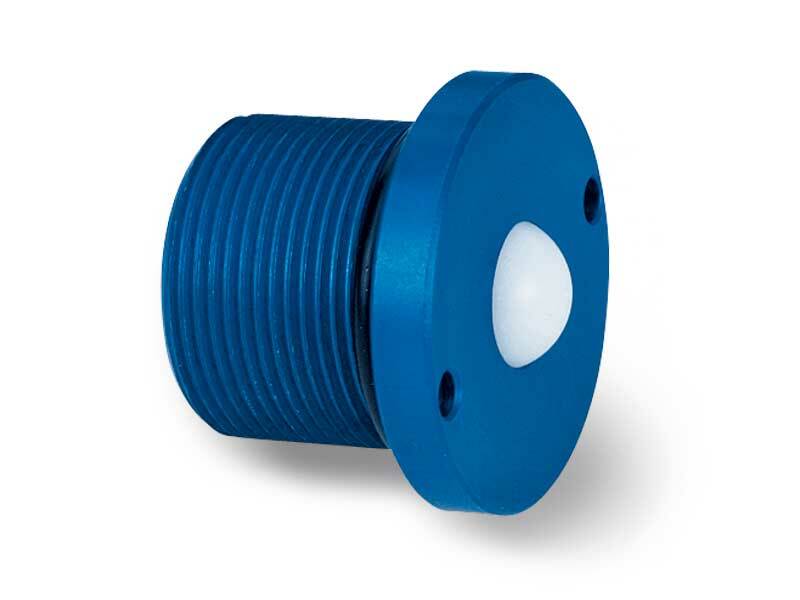 They are available in the simple plug version installed as standard and, upon request, with LEDs to signal the presence of voltage, with anti-interference circuits, protection devices against overvoltage and polarity reversal. When correctly installed, all connectors provide full protection against water jets, according to EN 60529 standards (protection class IP 65). Moreover, they meet VDE 0110-1 /89 standards, working voltage up to 250 V, overvoltage category II, Degree of use 3, regarding insulation class. In all contacts, a snap joint between contact holders and the external protection guarantees a safe locking and easy assembly. A safe locking is essential for guaranteeing the operator full protection when handling the connector. The contact holder can be easily extracted from its casing simply using a screwdriver. This operation also allows orienting the earthing contact in the desired direction. This small cam, which can be activated by a screwdriver, acts on the mobile core of the actuators causing their commutation. This device is installed, upon request, on compressed-air pilot-operated 3-way solenoid valves art. 07 .. 11 or vacuum solenoid valves art. 07 .. 40, to allow their opening and closing in absence of electricity. 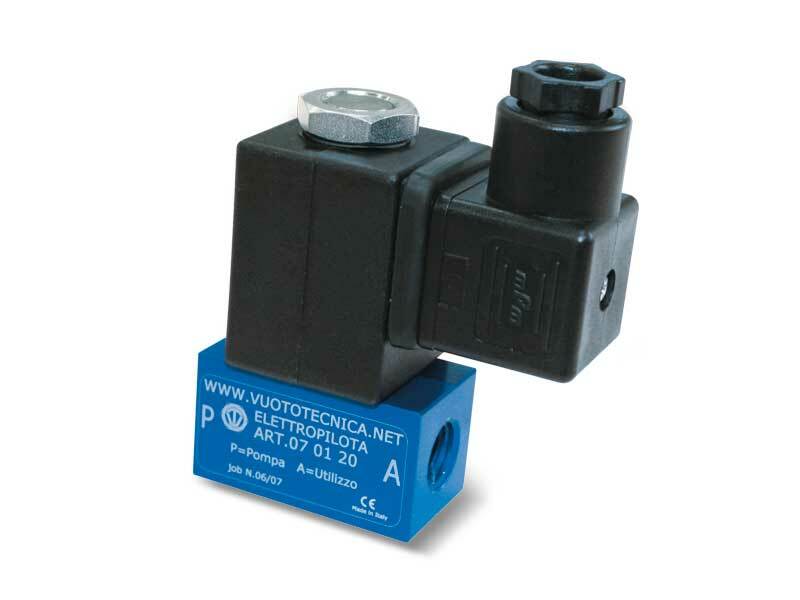 To order it, all you have to do is add the letters SM to the article of the solenoid valve. Sealing kits are composed of a membrane, shutters and standard O-rings installed on our compressed air and vacuum 3-way valves and solenoid valves. In presence of very hot fluids (up to 250 °C) or corrosive fluids, we can supply sealing kits in special compounds. Please contact our technical department. The 3-way vacuum solenoid valves in this series feature two positions with pneumatically pilot-operated conical shutters. They can normally be used either open or closed. They are composed of an anodised aluminium body where the connections are located, two shutters in vulkollan® assembled onto a stainless steel stem, a special compound membrane for the servo-control and a spring for the shutter return. 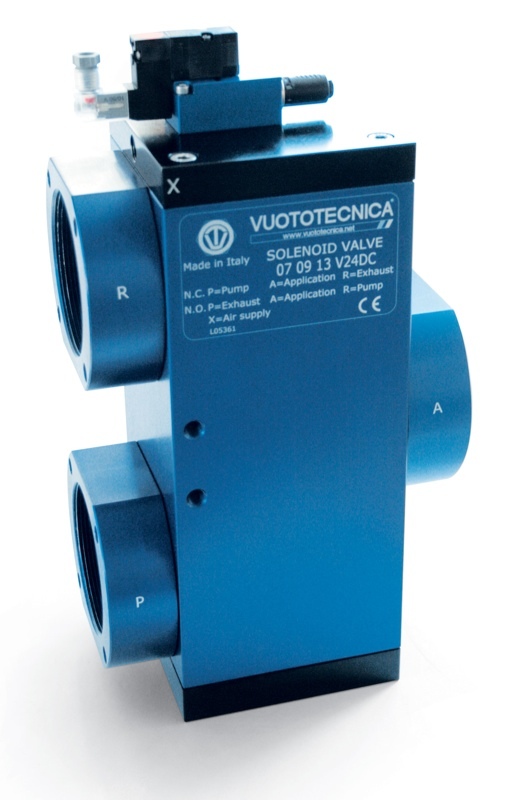 A solenoid pilot valve activated by a built-in electric coil, manages the compressed air supply. The particular execution of these valves allows reducing frictions and internal dynamic stresses to the minimum, which results in a high response speed and a guarantee long lasting operation. The electric coil of the solenoid pilot valve is fully plasticised with synthetic resin, tight execution, insulation class F (up to 155 °C) compliant with VDE standards, with 3 mm 2-terminal electrical connections in compliance with EN 175301-803 (ex DIN 43650)-C. Protection degree IP 54; IP 65 for inserted connector. Available for voltages of 12-24V/50-60Hz and 12-24V/CC. A push-button device, built-in the solenoid pilot valve, allows manually opening and closing the solenoid valve. 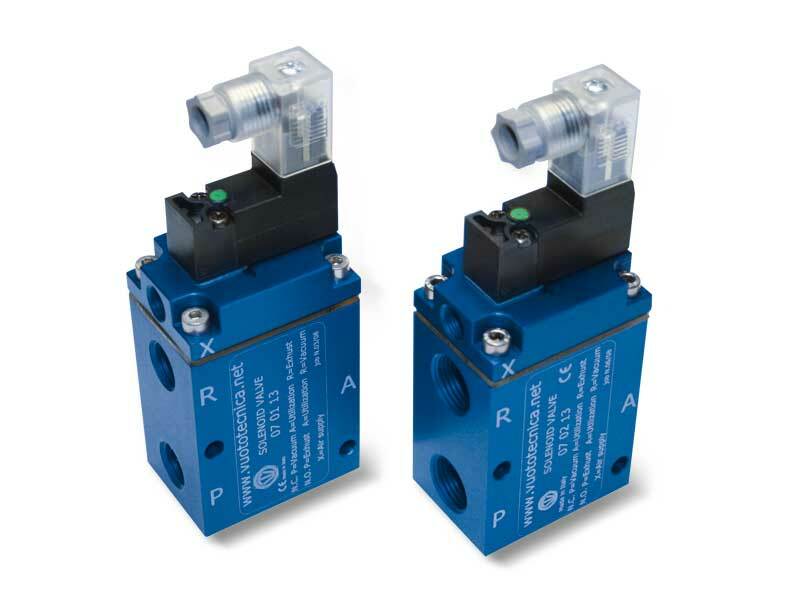 3-way vacuum solenoid valves are usually used for intercepting the vacuum in vacuum cup feeders and palletisers, robots, bag openers and in all those cases which require a quick exchange between the vacuum pump suction and the air inlet in the circuit, for a quick restoration of the atmospheric pressure. What differentiates them are the bistable impulse pilot valve powered by a low absorption fitted electrical coil which, with a simple electrical impulse, exchanges the shutter positions and keeps them there even in absence of electricity, until it receives a new impulse of opposite polarity. For this reason, they can only be supplied with direct current electric coils. This is the reason why their use is recommended in all those cases requiring maximum connection security at the vacuum source, even in the absence of an electrical power supply. 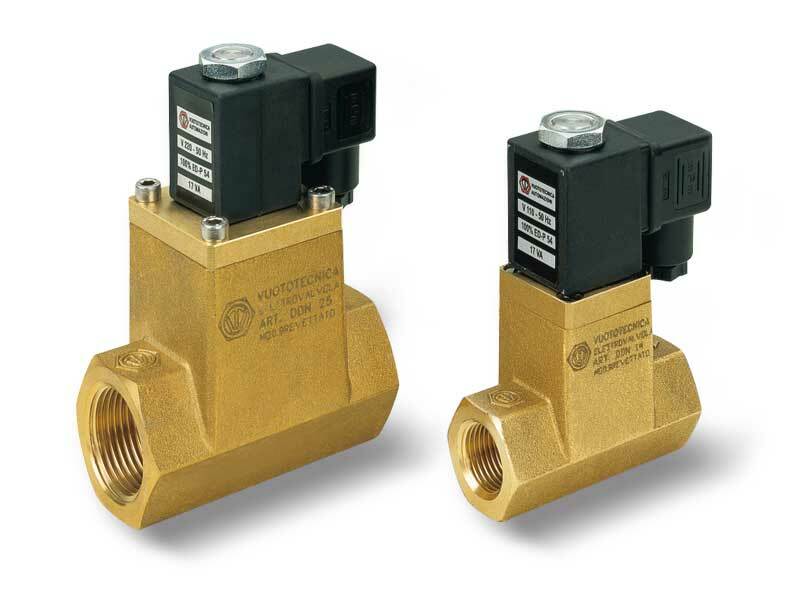 These solenoid valves have the same functions and structure as the previously described ones. Their distinctive feature is a bistable impulse solenoid valve activated by a built-in low absorption electric coil which, at a simple electric impulse, exchanges the shutter position even in absence of electricity, until it receives a new impulse of opposite polarity. For this reason, they can only be supplied with DC electric coils. They are particularly recommended in all those cases that require a safe connection to the vacuum source, even in absence of electricity. 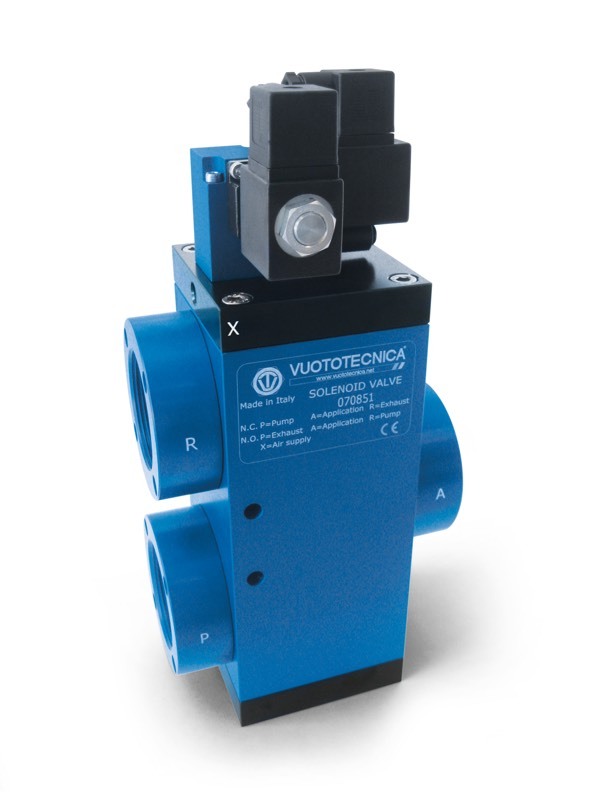 The electric coil of the solenoid pilot valve is fully plasticised plasticised with synthetic resin, tight execution, insulation class F (up to 155 °C) compliant with VDE standards, with 3 mm 2-terminal electrical connections in compliance with EN 175301-803 (ex 43650)-C.
Available for voltages of 12-24V/CC. 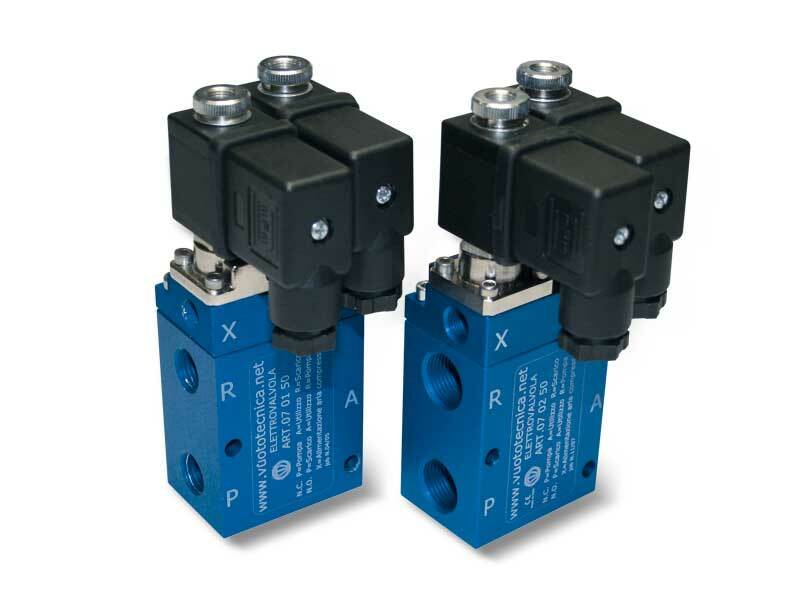 The push-button device for their manual activation cannot be installed on these solenoid valves. The direct drive 3-way vacuum solenoid valves of this series feature two positions with conical shutters servo-controlled by the vacuum. As a standard they are normally supplied closed, but upon request they can also be provided as normally open. They are composed of an anodised aluminium body where the connections are located, two silicon shutters assembled onto a stainless steel stem and a membrane in special reinforced compound. A solenoid pilot valve activated by a built-in electric coil manages the servo-control vacuum. The operating principle of these solenoid valves is based upon the pressure differential between the vacuum pump or generator and the pressure of the sucked air. By directing this differential pressure to the servo-control via the solenoid pilot valve, it is possible to control the shutters with no need for compressed air or springs. 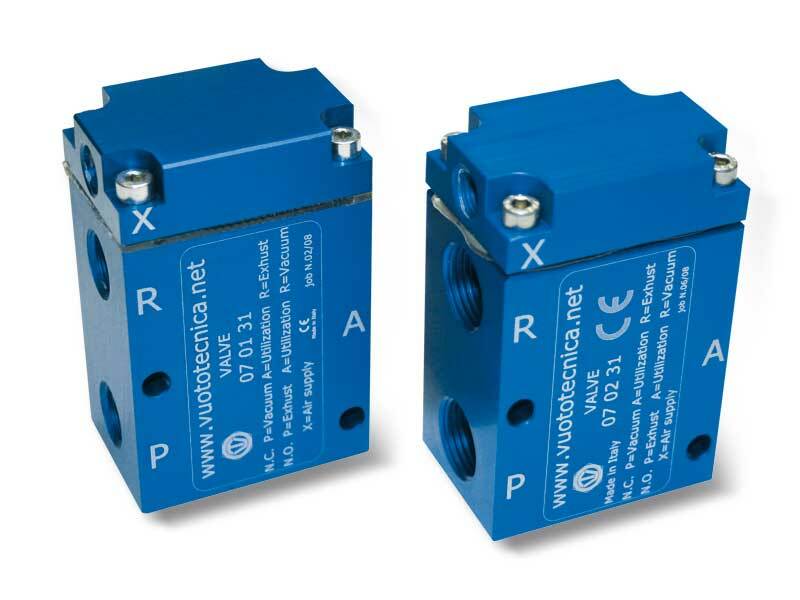 Due to their operating principle, these solenoid valves are not recommended for low vacuum level plants (below 850 mbar abs., equal to 15 % of vacuum). The absence of springs, frictions and internal dynamic stresses favours a high response speed and guarantees a long lasting operation. 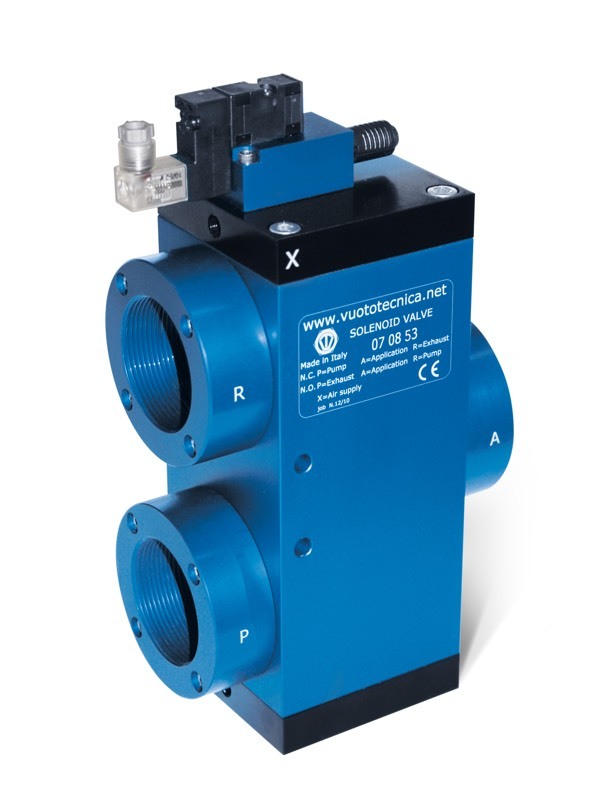 The electric coil of the solenoid pilot valve is fully plasticised with synthetic resin, tight execution, insulation class F (up to 155 °C) compliant with VDE standards, with 3 mm 2-terminal electrical connections in compliance with EN 175301-803 (ex DIN 43650) -C. Protection degree IP 54; IP 65 for inserted connector. The connector can be rotated by 180° on the coil and can be supplied, upon request, with Led lights, anti-interference circuit and/or with protection devices against overvoltage and polarity reversal. 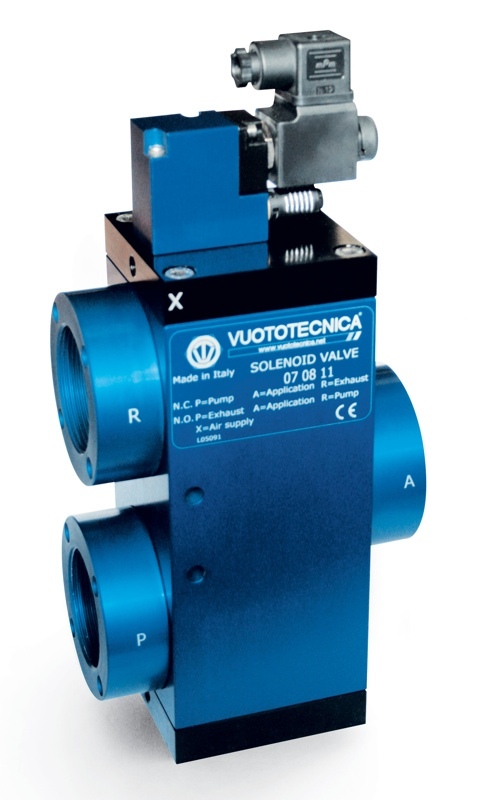 A push-button device built-in the solenoid pilot valve allows the manual opening and closing of the solenoid valve. 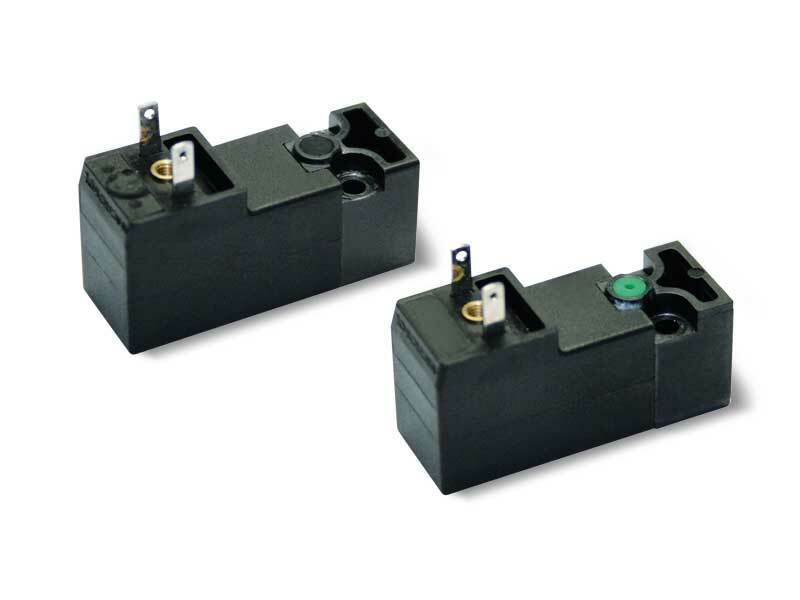 The solenoid valves of this series can be used in almost all the cases described for the 07 .. 11 series, and also on plants with no compressed air. The solenoid valve must always be chosen according to the capacity and, therefore, to the vacuum pump or generator suction connection. The electric coil of the solenoid pilot valve is fully plasticised plasticised with synthetic resin, tight execution, insulation class F (up to 155 °C) compliant with VDE standards, with 3 mm 2-terminal electrical connections in compliance with EN 175301-803 (ex 43650)-C. Protection degree IP 54; IP 65 for inserted connector. 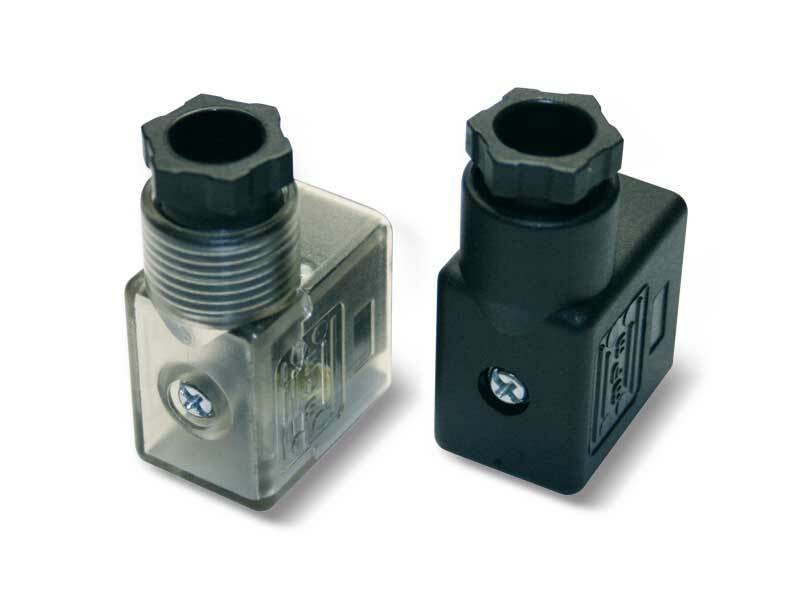 Solenoid pilot valves are small 3-way valves activated by a built-in electric coil able to manage the compressed air or the vacuum for piloting the solenoid valves. 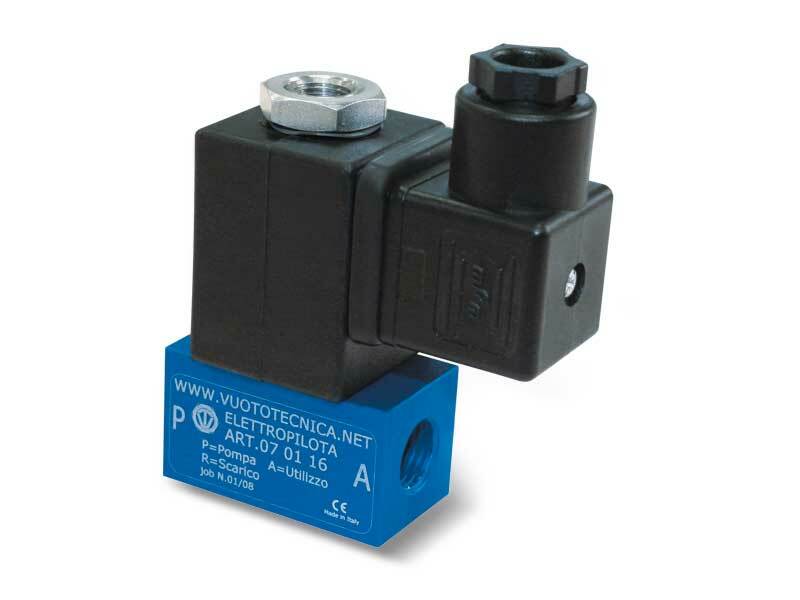 The electric coil of the solenoid pilot valve is fully plasticised plasticised with synthetic resin, tight execution, insulation class F (up to 155 °C) compliant with VDE standards, with 3 mm 2-terminal electrical connections in compliance with EN 175301-803 (ex DIN 43650)-C.
Connectors are essential elements for bringing electricity to solenoid pilot valves with built-in low absorption coil. They are available in the plug version, with a LED for signalling the presence of voltage and, upon request, with anti-interference circuits, with protection against overvoltage and polarity inversion. 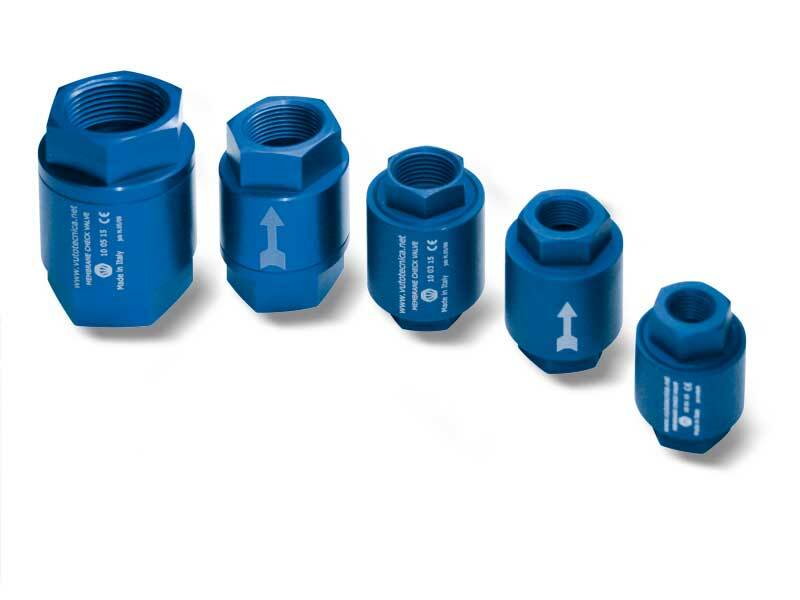 All connectors provide full protection against water jets, according to EN 60529 (protection class IP 65), when correctly installed. They also meet VDE 0110-1 /89 standard, working voltage up to 250 V, overvoltage category II, degree of use 3 regarding insulation class. 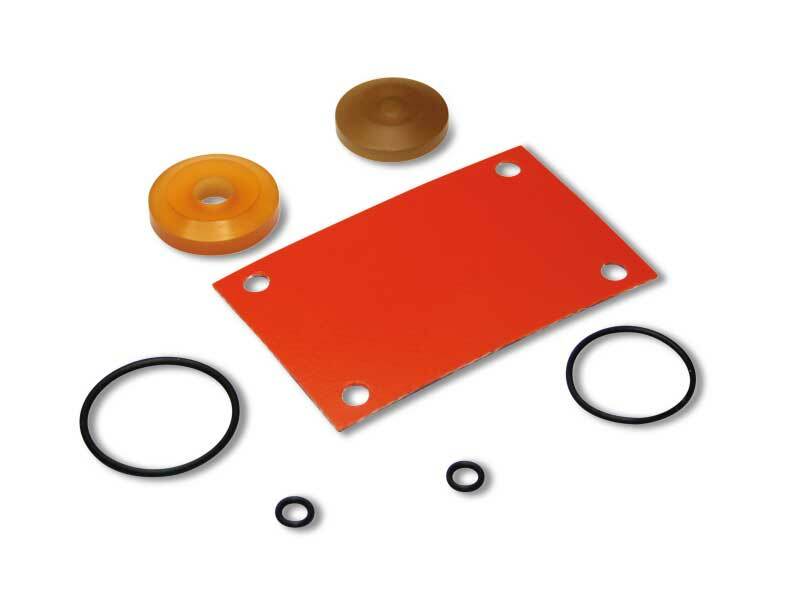 In presence of very hot fluids (up to 250 °C) or corrosive fluids, we can supply sealing kits in special compounds. Please contact our technical department.